How was it possible for Anne Frank, her family, and their friends to hide in the Secret Annex for 25 months without being discovered? The Franks and their friends, who were hiding in the Secret Annex, would have been discovered long before 25 months elapsed. There is no reason the inhabitants of the Secret Annex could not have hid for 25 months without getting caught. They made sure not to make noise when anyone else was in the building. Their protectors and the design of the annex also helped them remain hidden. Despite their best efforts, the Frank family and their friends did have several close calls. On one occasion, two neighborhood youngsters, who knew the warehouse had valuables, broke into the building. While in the warehouse, one of them later noted: “I suddenly heard the toilet being flushed. The pipe ran down the back just like in our house. I therefore understood immediately that there were people in the building and thought: ‘Let’s get out of here!’ We didn’t say anything about this. We were used to keeping our mouths shut because periodically we also had somebody in hiding at our house.” This situation, like others Anne writes about, shook the Franks and their friends to the core. Anne writes about how they often felt like they would be caught. Where the annex was located, in 263 Prinsengracht, was really two separate houses sharing a common warehouse space. This warehouse extended from the very front to the back of the entire building. From the street and canal, there is, however, no visible indication of a separate back portion to the house, where the annex was located. There are, however, windows in the annex that look out onto a courtyard area. This courtyard is surrounded by a block of houses, the backs of which share this common space. The entrance to the annex was accessible only through the private office of the director, Victor Kugler, who was one of the Frank’s protectors. The annex was hidden by a movable bookcase/cupboard that camouflaged its only entrance. Any visitors to the business were never admitted any further than Kluger’s office. Thus, people entering from street level could not directly access the staircase that led to the annex unless they went through Kugler’s office. Another of their protectors, Johan Voskuijl, built the movable bookcase. The installation of the bookcase would not have been observed by anyone who didn’t already know the annex was there. Ten o’clock, footsteps on the stairs. Father, pale and nervous, came inside, followed by Mr. van Daan. ‘Lights out, tiptoe upstairs, we’re expecting the police!’ . . . We thought of nothing, but simply sat there in pitch darkness . . . no one moved a muscle. Footsteps on the stairs, then a rattling at the bookcase. This moment is indescribable . . . A shiver went through everyone’s body, I heard several sets of teeth chattering, no one said a word. 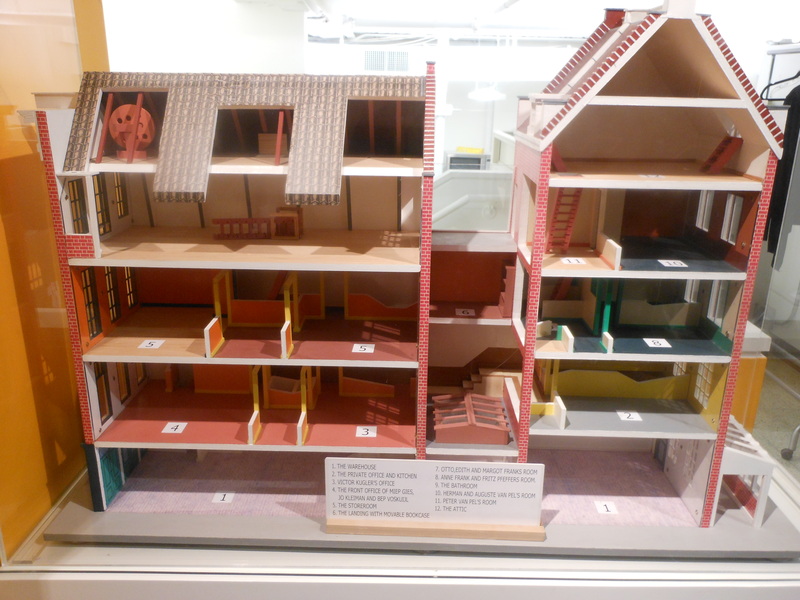 Anne Frank Model House, by Alexisrael [Public domain], Creative Commons Attribution-Share Alike 3.0, via Wikimedia commons. Eventually, the intruders left without discovering the secret of the bookshelf. This is a testament to its natural presence in the little room. When the Franks were arrested, the police came directly to the bookshelf door because their informant provided them with an exact location. Clearly, life in the Secret Annex was dangerous and precarious but several factors—the layout of the house, their protectors, and their caution—made it possible for the Franks and their friends to remain hidden for 25 months. It lasted until August 4, 1944, when their luck finally ran out. The residents of the annex took great care to be quiet and tried to give no sign that they were hiding there. Only when the office staff left the building in the evening and on the weekends were they able to resume a slightly more “normal” life. They were still very careful about lights and noise. Curtains covered the windows to the courtyard and a movable bookcase camouflaged the entrance to the annex. In spite of their precautions, they had several close calls. Similarly, it is apparent that at least some of the neighbors knew people were in the annex. For whatever reason, they chose not to turn them in. Whoever betrayed the Franks appears to have had no such reservations. For the reasons enumerated above, Faurisson’s position—that the Franks and their friends would have been caught immediately—is not supportable. Robert Faurisson, “Is The Diary of Anne Frank Genuine?” Journal of Historical Review, Spring 1982 (Vol. 3, No. 2) at www.ihr.org/jhr/v03/v03p147_Faurisson.html. All diary quotes are taken from the Anne Frank: The Diary of a Young Girl (Definitive Edition), translated by Susan Massotty, edited by Otto H. Frank and Mirjam Pressler (Bantam Books, 1994). See account of Hans and Els Wijnberg in Inside Anne Frank’s House: An Illustrated Journey Through Anne’s World (Overlook Duckworth, 1999), p. 53. Inside Anne Frank’s House: An Illustrated Journey Through Anne’s World (Overlook Duckworth, 1999), pp. 72-73, 98.